Greetings from Pinedale, Wyoming! “Where there’s just enough civilization,” reads the sign at the entrance to town. Now, I don’t know quite what that means, but I do know there’s just enough mountains, people, cows and water for me to feel at home. I’ve taken to dipping my toes in Pine Creek at least once a day. 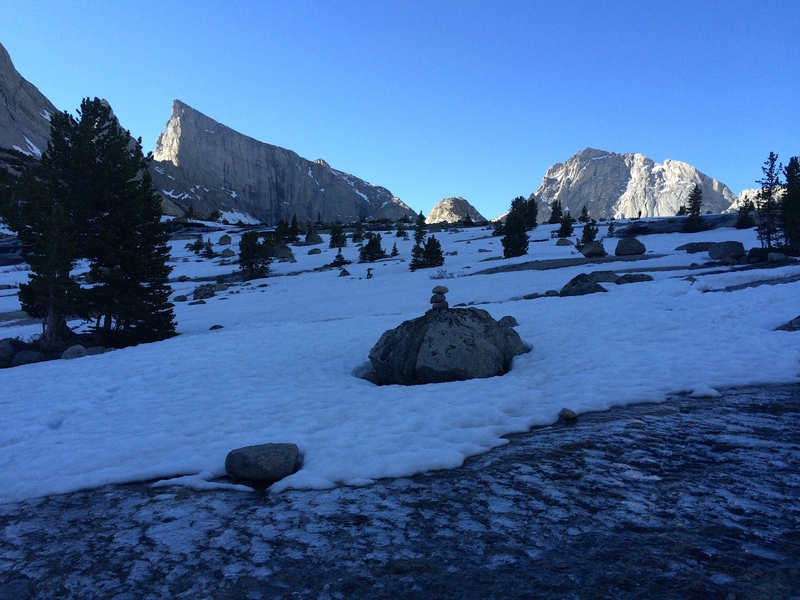 The water flows fast and full of snow melt. A mama and baby moose browse the shrubs across the bank; I see them from the green picnic table where I write and think. On one of my daily pilgrimages to the creek (Did I mention that “creeks” in Wyoming look a whole lot more like rivers?) I meet a hydrographer/county water commissioner with a clunky laptop. He gives me a crash course in Wyoming water law—where the “biggest and best use wins”. There’s no shortage of good conversations to be had here. In fact, I’ve started thinking of my “interviews” as just that: conversations. Some are spontaneous, others planned. But each interaction inevitably sheds light on what it means to live and work land in Sublette County, Wyoming. For a town that’s 1 square mile, with a population of ~2000, community gatherings and meetings sure do abound. 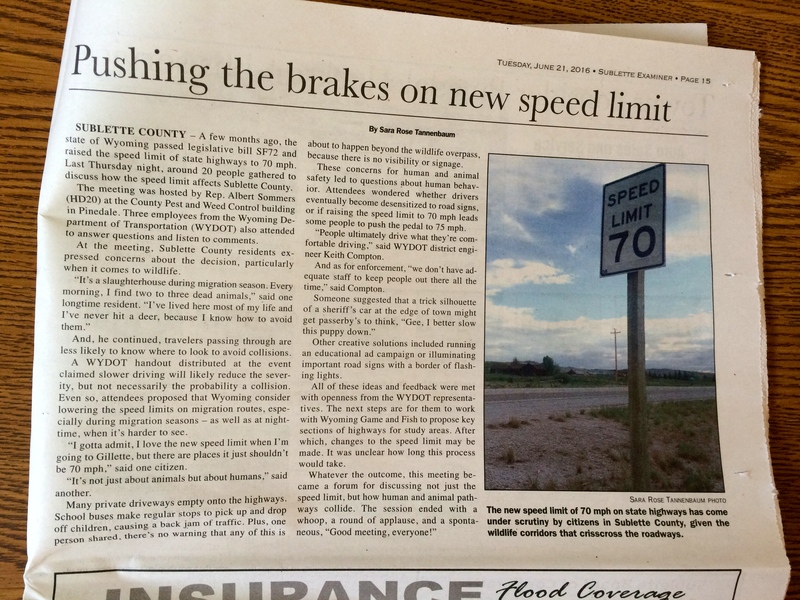 I wrote my first article for the Pinedale Roundup about one of them: a discussion regarding the new speed limit. Earlier in the month I attended my first cattle branding. 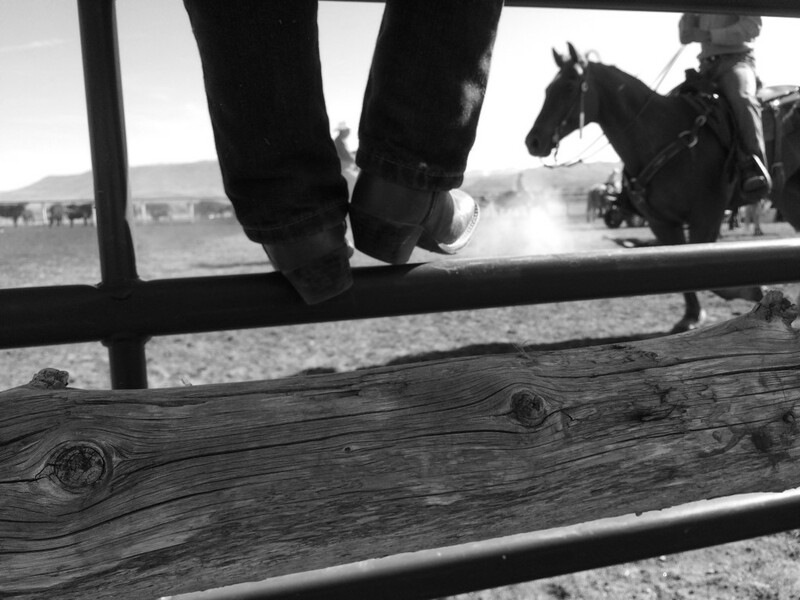 I saw some of those same ranching skills at Pinedale’s Ranch Rodeo—where cowboys and girls, young and old, ride broncs, rope calves and load trailers. The event ended with four cowboys trying to stay on a saddled cow the longest. Only one lasted longer than 8 seconds. Some of my research brings me outside of Pinedale, too. 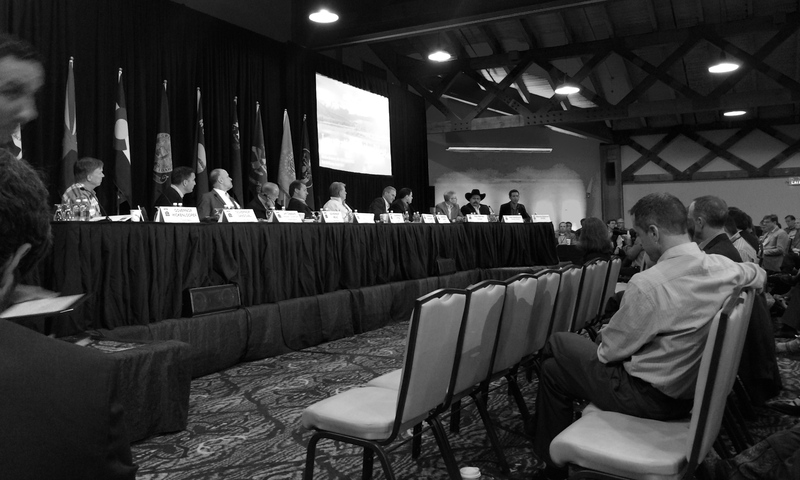 I found myself in Jackson at the Western Governor’s Association annual meeting, wearing a media pass and listening to Secretary of the Interior Sally Jewell speak about landscape level management. “Innovation” was the buzzword of the event. Then, not too many days later, I hiked into the Wind River Mountains to visit Taylor (fellow Western Research Fellow) and her research site out of big Sandy Trailhead. There I experienced how to make a home in the backcountry. There, I discovered the magic and poetry of the mountains, learned their names and many faces. Looking forward to all the learning that’s in store for the rest of my time in Wyoming! This entry was posted in People, Western Research Fellows, Western Resource Fellows, WRF 2016 and tagged Sara Rose Tannenbaum. Bookmark the permalink.